I know, I know. It's USL-2. 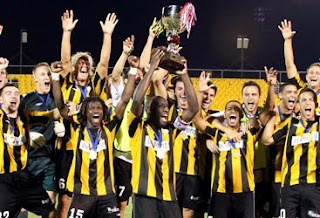 And it was the Charleston Battery. I mean, they were just playing in the USL/USSF/? or whatever they want to call themselves next season, just last year and voluntarily took the step down to USL2. Yeah, and they were the same team that took DC United the distance in the US Open Cup in 2008 and were in the quarters in 2007, 09, and 10. Look, where else would you see a 2nd div. team have a Supporters Cup between themselves and a MLS team? I'm sure one's out there, but I haven't found it yet. And don't give me the Timbers/Sounders thing, Timbers are going big time next year, so that doesn't matter. So what's the big deal? Eh, I'm partial to them. I grew up in the area before they were around, but have been back and caught a handful of their games. And you know what? For such a small stadium, the fans are knowledgeable, the stadium is intimate, and the atmosphere fun. Sure, their MVP and league scoring leader, Lamar Neagle, was signed by Seattle Sounders just last year, but apart from two assists in two games for them, he didn't make their grade and was waived. Not a bad pick up on Charleston's part. Especially since he opened the scoring in the title game. Charleston ending up defeating the Richmond Kickers 2-1. And they did it despite playing a man down when Charleston's Falvey was shown a straight red for tripping Delicate on what would have been a breakaway on goal in the 29th. Feel free to read the rest of the game report here. If you can't make it for a game when in town here, at least make it for their pub. It's been in the top 10 in the nation for soccer pubs a handful of times in the last 5 years. Truly a good place to have a beer before enjoying a game.